After the death of Angola's first president, Agostinho Neto, dos Santos stepped up as president in 1979 through internal party elections. He has been Angola's president for 28 years. While still a student, he joined the MPLA in 1956 thereby starting his political career. Due to the repression of the colonial government, Dos Santos went into self-exile in France in 1961. He later moved to the Republic of the Congo, where he collaborated with the MPLA, and soon became the vice-president. Furthering his education, he moved, to the former USSR, where he received an engineering degree from Azerbaijan Oil and Chemistry Institute. In 1970 he returned to Angola and joined the EPLA (Exército Popular de Libertação de Angola), a branch of the MPLA, becoming a radio transmitter in the second political-military region of the MPLA. In 1974, he was promoted to sub commander of the telecoms service of the second region and was named coordinator of foreign policy of the MPLA. He served as the MPLA's representative to Yugoslavia, the Democratic Republic of the Congo, and the People's Republic of China before being elected to the Central Committee of the MPLA in 1974. After achieving Angolan independence, the rebel groups MPLA, UNITA and FNLA started the Angolan Civil War, which would last 27 years. At the beginning of the war, dos Santos was named president of the MPLA and secretary of foreign policy. 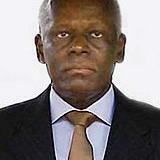 In 1999 , dos Santos gained greater power from the Angolan parliament by becoming Secretary of Defense. In this short period of peace, dos Santos has signed important contracts with corporations interested in extracting natural resources (oil and diamonds), controlled high inflation, and raised economic growth to an estimated 24%. Despite these economic advances, dos Santos failed to combat governmental corruption, reconstruct public infrastructure, draft a new constitution, or reduce control over the press. Although Angola's natural resources are among the world's richest, the UN Development Program considers Angola one of the poorest and least developed countries in the world such that the Mo Ibrahim Foundation in 2005 ranked Angola 38.1 on its "rule of law, transparency, and corruption" scale and 38.3 on its "human development" scale. Dos Santos announced in 2001 that he would step down at the next presidential election. However, in December 2003 he was reelected as head of the MPLA, and it is believed that he will be the party's candidate in the next presidential election, which is predicted to be held in 2009.